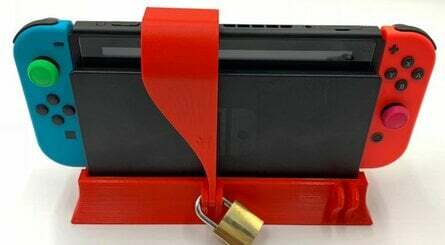 A Nintendo Switch 'Game Console Safe' has appeared on the market, giving customers the chance to rather literally lock their console to its dock for more security. The item is currently being sold on Etsy from seller 3Dexpressions, with its product description highlighting just some of the situations in which it could be useful. 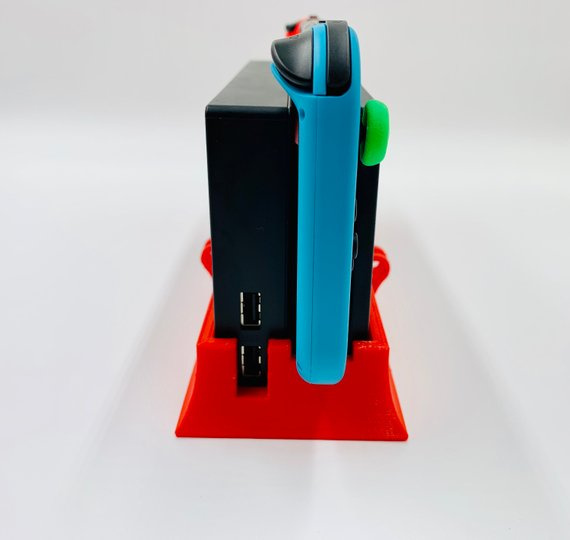 One example suggests that it can prevent any children from taking the console out of the dock without permission; another considers the possibility of you running a tournament of some kind, with the safe acting as a way to keep your console safe from any thieves. 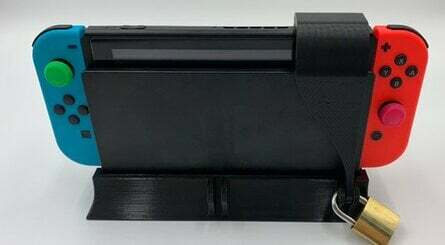 As you can see in the images below, the safe not only locks your console inside the dock, but can also be moved over to the right to completely cover the game card slot so that it cannot be accessed. There are several issues that spring to mind upon first seeing the product, however; you can still turn the console on, so children will still be able to play in TV mode anyway, and the Joy-Con can still be removed meaning that thieves could still potentially run away with your expensive possessions. Still, if you are the tournament-attending type, we're sure this would still go some way to deter any troublemakers. If you're interested, you can check out the product on its Etsy store page. 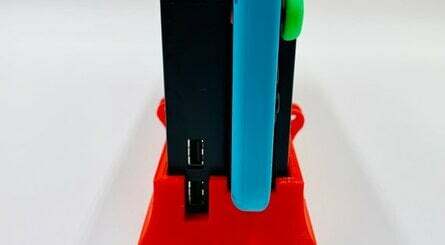 It comes in a wide range of colours, is 3D-printed from "heavy duty ABS plastic", and can be bought either with or without a lock depending on your needs (ranging from approximately £15 - £20). Would this be a useful accessory for you? Are you tempted to buy one? Let us know in the comments down below. To be fair, in tournament you won't want to leave Joy-Con attached, but you do want to have access to the Joy-Con rails for syncing purposes. @EasyDaRon or maybe handheld mode is what keeps them in bed, while this would force them to sneak up in the middle of the night to play it docked. But unless you fix the stand to the table, this is pointless. Also, what is the point in that padlock, if you really want to steal it, you could cut through the plastic rather than the padlock. This is up there as one of the worst inventions I've ever seen! They can't be serious? 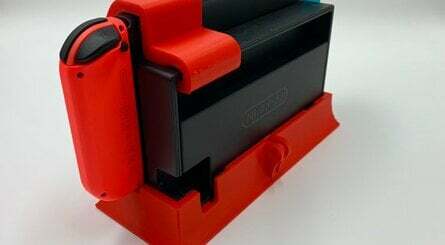 If someone really was going to nick your Switch, I'm pretty sure they'd want the dock too but even if they didn't, how on earth would this prevent that theft from happening? They'll just pick up the whole thing and cut it open at home. The covering of the game slot is equally as pointless. If this was the yearly NL April Fool article, I'd have been saying it's a good one, best yet! Seems like a thief could just take the whole thing, stand and all, pretty easily. Then cut through the plastic from the safety of their thieve's den. @Springloaded it would take an amateur around 10 seconds to break this lock. It gives the switch extra security, but does it make it more stable? It's a good idea and identifies a need for system security at tournaments, but this really does seem best suited as a home-solution for kid-proofing the system. @sanderev it's more that it's something .... We stand with our games at conventions, but look away for a few seconds and a console can be gone...this takes a bit longer than that! But in reality we never had anything get taken from a convention, people tend to be mostly nice folks. Unless you invite thieves in to your house, I don't really see the purpose of this. Play it docked will more likely be bright and loud enough to get parent´s attention. That´s why I think handheld mode will be a prefered kind of play secretly under the blanket to not wake parents up. Great security can be lock Console for Convention, Internet Cafe, Demonstration, Industrial, Innovation and Confidential. May prevent Stolen Console. Important security reliability. Or... Nintendo could just add a password to the switch which still seems like a glaring ommision on a handheld console. would be good for after-school programs and things of that sort. it’s a minor deterrent that would be enough to stop curious fingers from pulling the console out of the dock. This is like a DVD rewinder. A foolish item that serves very little purpose beyond preying on the technological illiterate. Although at least it has some functionality, just barely. The DVD rewinders literally did nothing but prey on people who didn't know better. If you think I am joking, that there was no way that existed, I am sure you can look it up for yourself. But back in the day, when we were transferring from VHS tapes to DVDs, I saw a lot of DVD rewinders at stores like Target and Meijer. Obviously meant to prey on people who didn't know better... Or perhaps as joke gifts. @Heavyarms55 : That's a novelty item. You can't "rewind" a DVD. The only thing that such a device would do is spin the disc (if that). The very idea is so ridiculously absurd that it is not even worth acknowledging. Perhaps, yes, it was designed to prey on brain-dead morons, but you needn't look further than the Amazon appraisals to see that people were in on the joke. I suppose it's one of those "Only in America" things if its availability was ever widespread (like the urine canister golf club). 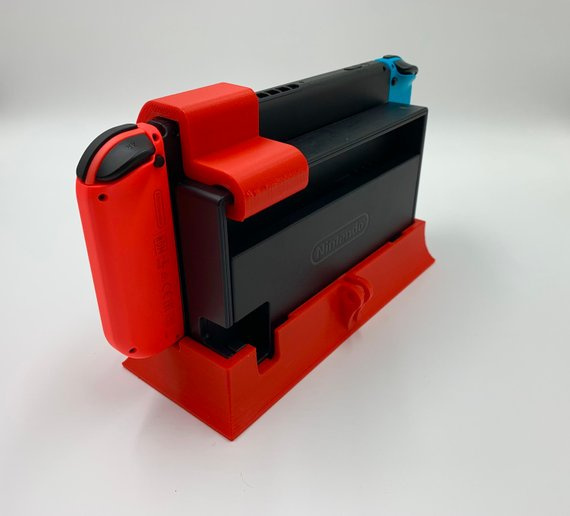 Something like this made of cast iron and with a Kensington lock socket would be more useful for the purpose of bringing a Switch to a public event. I feel like 3D printed plastic, even ABS, can't be fully trusted for security purposes. "Never pay another DVD rewind fee again! Compatible with all disc formats: DVD-R, DVD-RW, DVD+R, DVD+RW, CDR, CDRW, Audio CD, VCD. Multi-region, code-free rewinder capable of rewinding all 6 region DVD's including RCE/REA encoded discs. NOTE: this product is intended as a novelty. All disc and MP3 media are direct access and do not truly require "reqinding." However, it is very fun to hear the sounds, and watch the lights of this product. We have tested the DVD Rewinder with the next generation disc media including Blu-Ray®, and HD. The DVD Rewinder also works with Sony Playstation®, XBox®, and other disc based console system media." @HobbitGamer : The only way I could rationalise buying a suitcase lock is to prevent some schmuck from filling it with drugs. I wouldn't keep anything valuable in my check-in luggage, so I wouldn't be overly fussed about it going missing (except for clean undies, a precious resource that we much too often take for granted ). @Silly_G That...that's actually a good use, haha "These darn scamps are always trying to shove drugs in my luggage!" But....but....but....it's the home console you can take with you........ if you're going to throw a Kensington lock on it, why not just buy a WiiU? @Heavyarms55 "And if you still don't understand, you see, VHS cassettes had to be rewound. You'd watch a movie, then you'd have to wait like 5 minutes or so as the machine would rewind the tape. lol"
It's so so sad that this actually needs to be explained today. "Please be kind, rewind!" @OorWullie Disagree entirely. This is great for system security at tournaments. You couldn't just pick up the dock with it because it's plugged in - someone will notice you in the time it takes to unplug the power adapter and HDMI cable. Just swiping the console out of the dock on the other hand? Extremely easy to do undetected, and this at the very least deters people from doing that. Couldn't you just pick up the Switch and take it with you, lock and all, if you wanted to steal it? Doesn't work if you're one of the 30% who uses it exclusively as a handheld! Seems useful for people using it as a public demo console of sorts, but I don't see any other purpose for it. 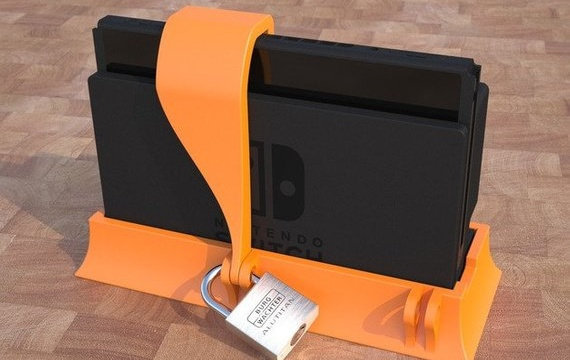 Not content with the already super duper secure Nintendo Switch 'Game Console Safe' and yearn to achieve the impossible by enhancing said security further? Well, with the Nintendo Switch 'Game Console Safe Table Lock', you can do just that! 1. 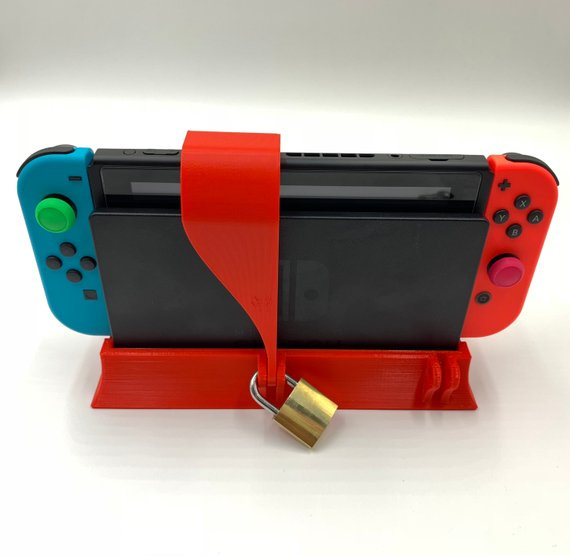 Insert the Nintendo Switch into the Nintendo Switch 'Game Console Safe' and secure with the padlock supplied with the Nintendo Switch 'Game Console Safe' (security of supplied padlock not guaranteed). 2. 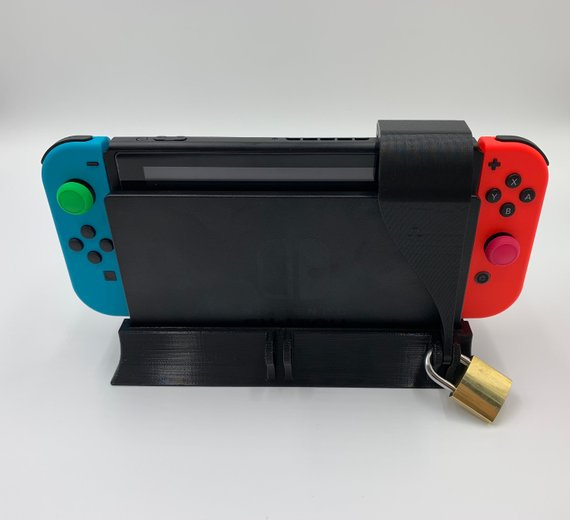 Connect the Nintendo Switch 'Game Console Safe' with inserted Nintendo Switch (not included) into the Nintendo Switch 'Game Console Safe Table Lock' and secure together with the padlock supplied with the Nintendo Switch 'Game Console Safe Table Lock' (security not guaranteed blah blah blah). @NEStalgia Nothing needs rewinding these days. My students were born right around when the last VHS tapes were being dumped into the final clearance baskets. I steal Switches regularly, especially when someone is hosting an event. Now THIS will surely prevent me from stealing any more!